Wallstrip, the web show with a pop culture take on the stock market, have been bought by CBS News according to Jossip. The blog claims that the price tag where around $5 million, which should boost the wallets of investors Fred Wilson and Howard Lindzon I’m sure. This is interesting of course, since it appears that Wallstrip is making no or little money. TechCrunch’s Duncan Riley (former blogger here at 901am) confirms the story and I’ll add my own belief to his: that CBS is looking for an Amanda Congdon 2.0 in Wallstrip host Lindsay Campbell. Pandora, one of the best online music recommendation engines out there, recently had to cut off their international users, leaving access only to the US, Canada and the UK. But there are still ways to access Pandora, using proxy servers. Proxies also anonymize your net surfing. Frantic Industries and Digital shows you how to get Pandora. [via Lifehacker]. Digital Alchemist also offers some suggestions for listening to Pandora outside the coverage area, and offers some Pandora alternatives. Last.fm is on the list, but there are rumors of them being bought out by Viacom. This might actually save Last.fm, since the capital for royalty payments will be available. Of course, the independent radio station always has a mighty struggle, whether over the airwaves or online. No kidding, I’m stating the obvious. paidContent reports that VideoEgg received US$3.5M and iAmplify received US$6M. Thing is, with such cheap hosting services available, if you have a rich media website idea, get it implemented now, before the new tech bubble bursts like some people are saying (namely me – between 2009-2011). 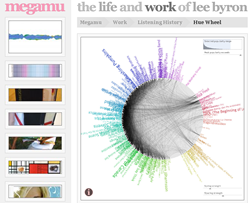 Lee Byron has created some fascinating infographics based on comprehensive Last.fm user data. He uses algorithms to generate the graphics, then produces posters as tall as 6′ 3″. [via Information Aesthetics] If Viacom buys Last.fm, they should buy some of these posters for the lobby of their headquarters, hopefully to remind them to keep Last.fm grassroots. Editor and Publisher has at least four posts talking about layoffs in the publishing biz. That’s just this week alone. Need ringtones for your cell phone or VoIP software? Check out Public Domain Sounds. [via 21Talks] I haven’t listened to any of these, but it seems that you can probably use them for audio or video podcasts as well. They have an interesting presentation and even use a tag cloud to show what categories hold the most samples. If you like what’s there, you can subscribe to any of several RSS feeds.